How did we even get here? Seriously. It kind of blows my mind that exactly four years ago today I figured out how start a free blog in WordPress – which is a feat in itself since I barely know how to upload an attachment to my email. Four years ago, I actually created three blogs: each aptly named a different James Taylor song. Why I stuck with “how sweet it is” is still beyond me, but it probably had something to do with a current chocolate craving and the fact that it didn’t sound quite as depressing as “like everyone she knows.” Mid-twenties drama. You know it. Doing stuff (so professional, I know) on this blog yanked me out of that quarter-life crisis (which wasn’t too much of a crisis, but um, have we met?) and completely changed my life. So cliche. But so true. It’s kind of odd and crazy and awe-inspiring when what you’re doing as a hobby turns into a dream job. And while it isn’t exactly my dream job, it has led me even closer to my actual dream job and let’s be real: it’s pretty dreamy. I don’t take for granted one second that I am lucky enough to do this as “work,” and yes, even though it brings in an income for me, it is not at all why I do what I do. Four years ago, I started posting recipes at 7am every morning. I didn’t make a dime for a loooong time. And four years later, I still do the same. Because I freaking love it. I freaking love YOU. I cannot thank you enough for stopping by here every day and reading the obnoxious and often inappropriate and sometimes embarrassing and possibly even offensive sentences that I spew on this little space on the internet. I am so insanely grateful that some of you have been here since the days when my pictures looked like this and that some of you may be landing here today, for the first time. As weird as it may seem (and trust me, if I was reading this as a nonblogger, it would be weird, like get-a-real-life weird), blogging is a whirlwind and it’s hectic and it’s easy to get caught up in what it all means. But at the end of the day, it’s the real life stuff that counts. It’s why I treasure every single one of you and the relationships (too much?) we’ve built and this nutso community that we’ve created out of our invisible internet friendship. It means the world to me that we can bond over sprinkles or denim vests or neon nail polish and things that are way too immature for us – and that we can even respectfully disagree on things and be honest and real. It warms my soul that you actually read large walls of text like the one I just wrote. Four years ago, I was in my twenties and well, now… I’m not. Four years ago I was pretty lost and heck, even two years ago I was still kind of lost. Something inside of me demanded that I remain true to myself, be only myself, whether it wasn’t cool or hip or accepted or as popular as others or even understood. Whether it was annoying or brutally honest or transparent or unbelievable. Sure am glad I did that though. You know the real me. Minus the occasional meltdown. 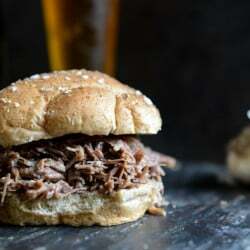 Crockpot Brown Sugar + Roasted Garlic Pulled Pot Roast Sandwiches. I never comment but I always read your blog. When I sit down for my lunch break, it’s my little treat. You always make me laugh and your pictures are so deliciously perfect. This is actually my first time checking out your blog and I was laughing at your comment comparing your old pictures to your new ones. I’m sorry if you posted this elsewhere, but how do you edit your photos now? Congrats on four years of being unique, hilarious, inventive, and awesome. Your blog remains one of my favorites since I started reading two years ago! I have to tell you, I read your blog every. single. day. And even when I’m not hungry (which is extremely rare) I always immediately make a shopping list and have grand ideas of actually recreating your recipes. So even though I don’t always actually get my rump into the kitchen I want to thank you. Thank you for the constant inspiration, and your very relatable way of writing, your fantastic recipes that are essentially catered to my likes and your constant, never ending love of neons, makeup and the 80’s. Glitter forever. Your blog is far and away my most favorite out there. So glad I stumbled upon it one day two years ago. Lovelovelove. Happy Anniversary!! Okay, for some reason I never caught the JT reference in your blog title! You are adorable. I’ve been reading your blog religiously for about a year now and have never commented before, but after reading this bea.u.tiful post it had to be done! You’re freaking adorable and I’ve had so many innapropriate giggle-fits while reading your blog in work that by rights I should probably be unemployed right now, but thank you so much for creating this lovely little escape that makes me laugh like a cartoon character and sets my tummy rumbling. It really has brightened up some crappy days, kind of like the internet equivalent of someone giving you a spoon covered in peanut butter and a hug. A little late but… congratulations lady! !